This how-to will show you how you can hide products, make products live instantly, or set products to publish at a certain date and time. 1) Login to your Shopify admin account. 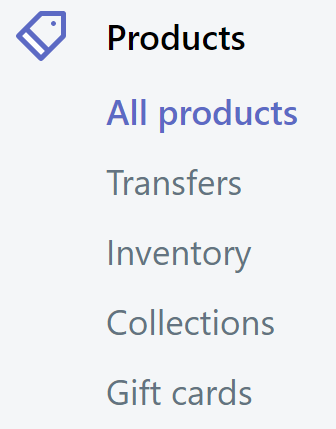 2) Select "Products" then "All Products." 3) Click on the product you would like to edit OR click "Add Product." 4) Locate the "Sales Channels" section at the top right of the page. 5) If you want to hide a product or make it visible again, click on "Manage" in the Sales Channels section. If you want to simply schedule the product to go live at the certain date and time, skip to #7 below. 6) When you click "Manage," a new settings box will appear on your screen. If you leave the "Online Store" box checked, the product will be visible to the public. If you un-check the box, it will hide that particular product from the site. 7) If you want to schedule a product to go live at a certain date and time, you will need to click on the small calendar icon in the Sales Channels section of the page. 8) Clicking on the calendar icon will open up a date/time picker so you can set when a product will become visible. As always, save your changes when you are done editing. If you have any questions about this help document, please submit a support ticket or give us a call at 866-440-3158 ext. 2.